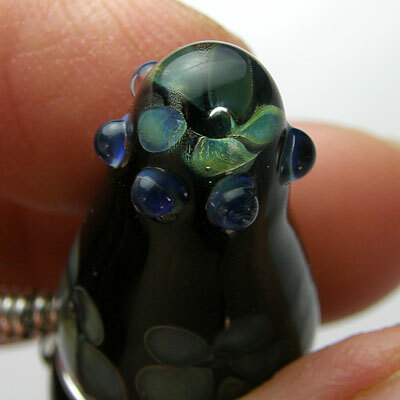 FLOWER POWER - This is an beautiful black vessel pendant! with four lovely flowers around the middle! 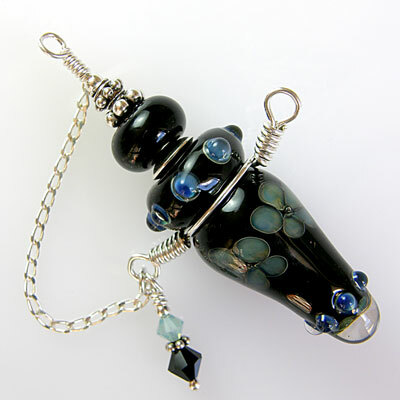 The small bead assembly has a tiny cork attached to it that pops out so you can put in a few drops of your favourite perfume or essential oil. There is a little safety chain attached so you have no worries about losing it. 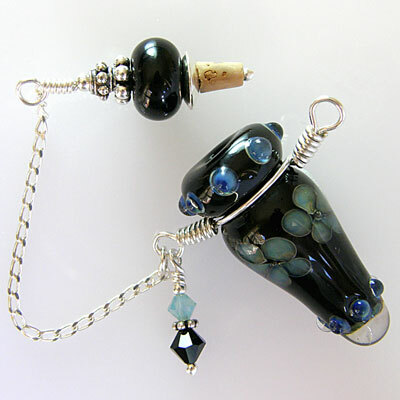 Materials used are black and silver rich glasses, sterling silver wire, beads, caps and chain, swarovski crystals in Jet and Pacific Opal. Look at the end of the vessel and you will find a flower encased thickly in clear glass. FLOWER POWER vessel includes a black silk cord with sterling silver components and a hook on one end that attaches to the loop on the wired "arm". All spacers, wire and chain are sterling silver. Vessel measures 58mm in total length x 17mm at widest point (not including wired "arms") .